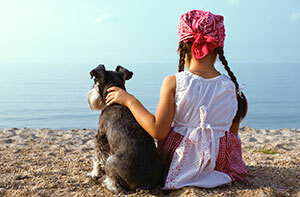 We currently have five dog-friendly homes at Ocean Isle Beach. If you desire a larger selection of dog-friendly vacation homes, take a look at our selection of over 40 dog friendly vacation homeson Sunset Beach. Dog - friendly homes require a $150 non-refundable fee when guests bring a dog, which will be added to the rental charge. There is an allowed maximum of two dogs totaling 150 pounds per rental home. Each guest is responsible for any and all damages to the premises caused by their dog, including, but not limited to: urine, chewing, scratching or destruction of property. Each guest must pick up after their dog at all times in all locations on the island. NO EXCEPTIONS-IT'S THE LAW. Excessive barking is prohibited. If your dog has separation anxiety, do not leave him/her in the home alone. Guests found in violation of this regulation will be fined and/or be asked to leave, forfeiting any remaining rental nights. Please be conscious of your neighbors, many of whom reside permanently. Dogs must be even-tempered, well behaved, sociable, and in good health. If your dog is anxious, aggressive, or likely to be highly stressed, it is probably in their best interest to make alternative plans. All dogs are required to use flea prevention such as Frontline or Advantage. Please be sure to clean and vacuum regularly during your stay. We wish you and your dogs a happy and safe vacation on Ocean Isle Beach! We have a lot of traffic during the summer. Dogs off leash are at risk of being hit by cars and are in violation of leash laws. Keep your dog on a leash at all times. Salt Water: If a dog drinks this, it will cause vomiting and diarrhea. Please have water available for your dog when walking or out on the beach. Beach sand and pavement become very hot during the summer.If you cannot walk on the sand or pavement in your bare feet your dog will be uncomfortable also. In case of an emergency any of our local veterinary hospitals may assist during normal business hours. At night or after hours emergency service may be limited. Please keep this in mind if your dog is ill or has a chronic disease. Local veterinary hospitals: VCA Seaside Animal Hospital in Calabash, or Ocean Isle Veterinary Hospital in Ocean Isle Beach. For after hours emergency service: Animal Emergency Hospital of the Strand in Myrtle Beach, SC.